Are ballet flats still "in" this season? 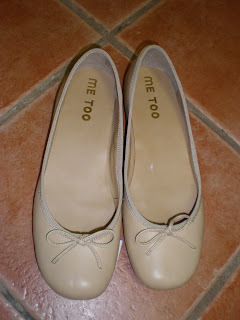 Not that I really care, I'm going to wear them anyway. I love the way heels look. They make a woman's figure more womanly. Give her the right curves and longer lines. BUT I soooo dislike wearing heels! I have never ever found a pair that I can wear without wincing in pain for days afterward. I have feet as flat as Sherri Shepherd's earth- zero arch. They do not like being so mistreated and forced to support my entire body weight on the ball of my foot all night. And who can blame them? I know I look better and I promise I do wear heels to important events like weddings. But every other day, I wear flats. So about a month ago I found these cutie flats on sale ($15) in Marshall's. The color is not ideal- I really would want them in a chocolate brown if given the option. But they are a decent neutral and they are hands down THE MOST COMFORTABLE SHOE EVER!!! I love them! I brought them home and wished and prayed that I would have the luck to find them in chocolate too. Enter this past Friday evening. I popped into Marshall's to return something and instead walked out with this collection. Chocolate brown driving mocs by the same maker, Me Too. 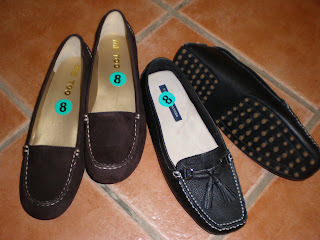 And another pair of heavenly comfortable black driving mocs by Tommy. My old pair of black mocs was on it's last leg (hehe- sometimes I think I am so funny!) last year so these are definitely needed. 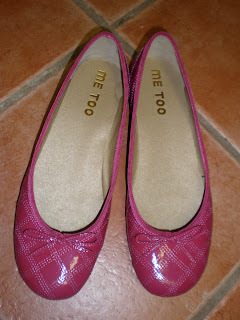 What was not truly needed but had to come home with me anyway was this darling pair of pink quilted flats. Oh they were just too cute to leave in the store. AND....my ruby red slippers! Are they not the most fabulously fun shoes ever? Do you want to know what I paid for my red shoes? I knew you would! Just $10! I love love love them! I feel like Dorothy, minus the pig tails and bicycle. Say it with me now...."There's no place like home!" Ooooooh! The red ones are so cute! SO cute! Love the pink ones the best! There's so many times when an otherwise blah outfit just calls for some red shoes. Those are perfection! Love the tommy shoes too! I have quilted black ones and love them. And ballet flats are not out of season. Just look at the J Crew website, they offer them all year round. Wow, you really scored some great finds! Very cute! Love the pink ones! I am never that lucky at Marshall's. Love the pink ones! I am never that lucky at Marshalls. Marshall's here I come! I have to have the quilted pair! And I am in complete agreement with the heels issue-cute but too painful for regular use! awesome find - I LOVE the chocolate brown ones! I love those driving mocs! I love all of these flats.I recieved my gift it was amazing thank you so much. I really don't know what to say. 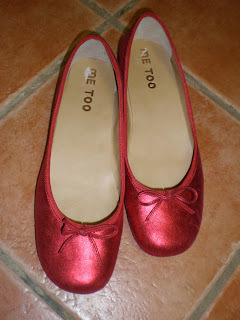 I love those red flats & the pink ones too....heck I love all of those shoes! I love the driving mocs and the pink ones! I wear flats every day now and love them. I LOVE those red ones. They are so girlie looking and would be awesome with jeans or a dress. I. need. to. go. to. Marshalls. NOW. Too bad I am already in my pjs. I think flats are always in!!! Those pink ones are to die for!!! Great finds .... the pink ones are my favorite. Oh, these are just too cute and too cool! Whether or not they are 'in fashion' by other standards, we're not too concerned, as we're like you... we are still wearing them. Frequently! Thanks for posting them all! Love the fuschia ones! Great finds, girl! They are so cute!! I don't even own heels......I totally can not walk in them!!!!!!!! I guess I am a fashion misfit!